What markets and technologies will drive growth in 2018. A recurring theme of the recent Industry Strategy Symposium (ISS) in Half Moon Bay, California, was how the explosion of new applications such as autonomous vehicles, digital healthcare, quantum computing, and crytocurrency mining are driving the need for more industry-wide collaboration to enable companies to compete in the “Data Centric” era. 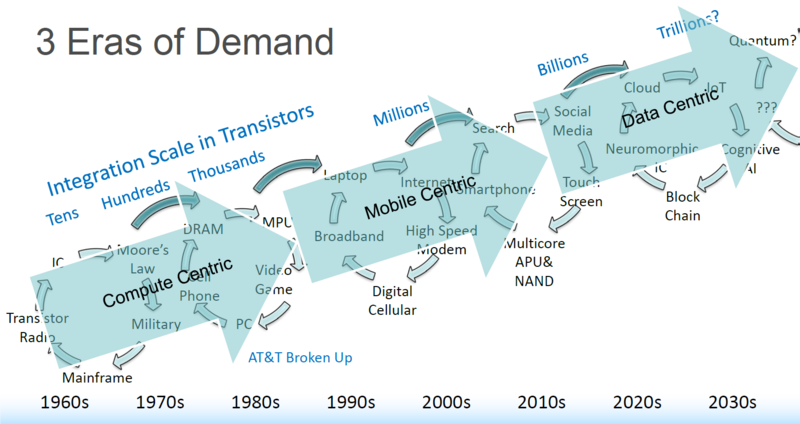 The resulting digital economy is creating unprecedented demand for semiconductors but also presents unique challenges. The conference’s opening keynote speaker, Kevin Bandy, Vice President, Chief Digital Officer, Cisco, observed how Artificial Intelligence (AI), Internet of Things (IoT), and Security are not distinct and separate and that businesses need to reimagine work and value to better meet customers’ needs. He went on to note that this has created a surge in demand for talent that is currently unmet. Where there are challenges, there are also opportunities. Growing demand for semiconductors along with strong memory pricing propelled the 2017 semiconductor industry to record revenue levels. Semiconductor revenues exceeded $400 billion, while the semiconductor equipment and materials markets reached new highs as well. Robust demand is expected to continue this year, with semiconductor revenue growth forecasts averaging 8.3 percent. Both the semiconductor equipment and materials markets are expected to grow this year as well – at 7.5 percent and 3.4 percent, respectively. What is driving growth in 2018? According to IHS Markit, the strongest drivers are next-generation handsets incorporating new features like biometrics, AI capability and longer battery life; advanced safety features in automotive electronics; and the accelerating migration toward internet-connected consumer electronics devices. New server installations supporting cloud computing is a major driver in the data processing segment. In particular, TSMC highlighted High Performance Computing (AI, crypto mining), IoT, and Automotive as key drivers in its recent quarterly investor conference. 2018 is well positioned to be another record-breaking year for the industry as the digital disruption continues to transform business models and the way we live our daily lives. To hear more about 2018 semiconductor market trends and outlook, please register for SEMI’s upcoming complimentary webinar, 2018 Global Semiconductor Market, What’s in Store? on January 24, 2018, at 10:00 AM PST. I will share SEMI’s market outlook with you. Please click here to register.